Sever your ties with uncomfortable mountain bike clothing, and instead, embrace a pair of baggies that are built to move with you, offer ample stretch, and have the coverage you need for bushwhacking into the backcountry to discover untouched rock gardens and root-laden tree lines. Slide yourself into the iXS Sever 6. 1 Shorts for women and you'll be ready to shred, thanks to a blend of recycled PET polyester and elastane that breathes and stands up to abuse from stray branches. This perfect blend of support and give sets you up with all-way-stretch so you're never restricted in the saddle, whether mashing up a deer trail to explore what might lie around the next corner, or tail whipping off of rollers. 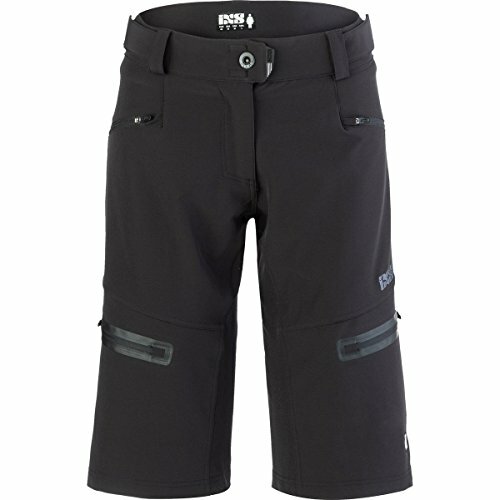 You'll be happy to find the long, and loose cut of these shorts setting you up with the right amount of coverage on DH days, with the room you need to throw pads underneath, and the coverage that seals the gap of hook and loop straps, so you don't deal with uncomfortable bunching or bare spots. The polyester and elastane blend breathes with ease, pulling sweat away to keep you dry when the ride gets pedal heavy, or the temperature starts to soar. If you're not one for riding with a pack on all day, you'll be pumped to spot the 4 zippered pockets that offer ample storage for your essentials and snack packs.